PSNews – Lieutenant General Nguyen Van Son, Deputy Minister of Public Security on November 5 led a high-ranking delegation of the Ministry of Public Security worked with the Ca Mau Provincial Police. The working mission included leaders of under-ministerial agencies of the Ministry of Public Security and Chairman of the Ca Mau Provincial People Committee Nguyen Tien Hai. Deputy Minister Nguyen Van Son speaking at the event. At the event, Senior Colonel Phan Thanh Sy, Director of the Ca Mau Provincial Police Department briefed the delegation on the unit’s task performance in 2018. According to Senior Colonel Phan Thanh Sy, the provincial police force well maintained local security and safety during the last year, contributing to social-economic development of the province. The force absolutely safeguard important projects, as well as political, cultural events and foreign affairs activities in the province, while taking drastic measures to prevent, detect and fight plots and activities of hostile forces. The Ca Mau Provincial Police Department also tried the best to bring into play the strength of the people in preventing and combating crimes; opened campaigns to crack down on criminal cases; and improve the quality of legal work, administrative reforms, and judicial reforms. Meanwhile, the movement “All people protecting National security” was expanded, contributing to ensuring security and order in the new context. According to statics, 460 out of the total 535 criminal cases (over 85.9%) were investigated and solved but 100% serious criminal cases were resolved. Deputy Minister Nguyen Van Son visits and checks task performance of Ca Mau police. Speaking at the working session, Deputy Minister Nguyen Van Son praised the efforts and achievements over the past time of the Ca Mau Provincial Police. 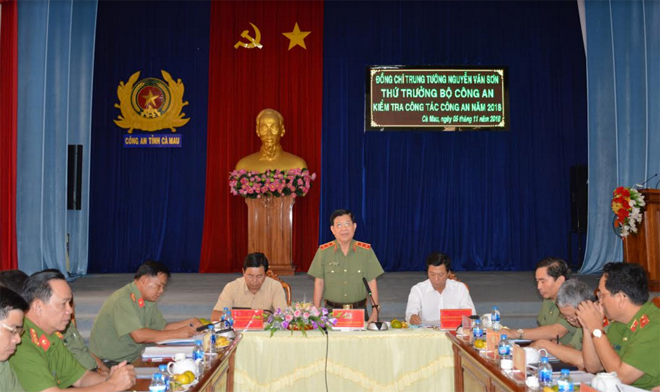 On behalf of the Central Public Security Party Committee and the leaders of the Ministry of Public Security, Lieutenant General Nguyen Van Son expressed thanks to Provincial Party Committee, People's Council, People's Committee, and local organization and people for their supports for the whole police force in general and the local police in particular. In order to fulfill all police tasks in the upcoming time, Deputy Minister Nguyen Van Son urged the provincial police to resolve all complicated issues arising from the grassroots without letting them happen unexpectedly; to synchronously implement professional measures, effectively combat the activities of various kinds of crime; to address complex security issues in key areas; and to focus on combating gangs. 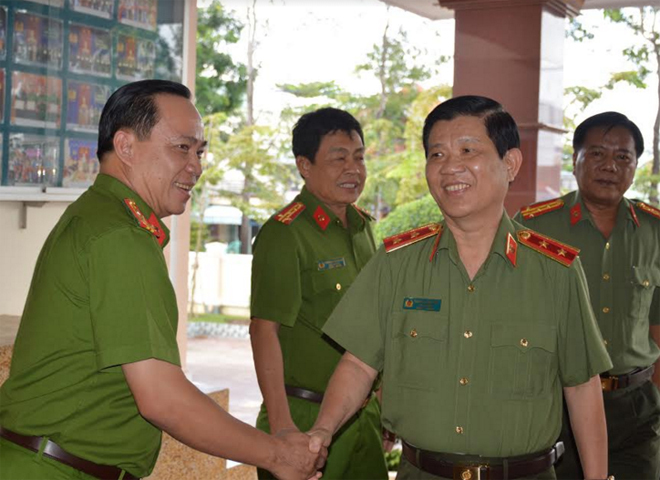 He instructed the leadership of the Ca Mau Provincial Police to continue their efforts to effectively fight wrong information and views of hostile forces; and promote the movement of “All People protecting National security”.